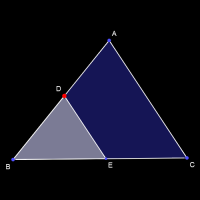 Drag points A, B, and C to change the size and shape of the blue triangle, and its white counterpart that is similar (constrained by proportional SAS). Drag the Red point D to change the ratio in sizes. Observe the multitude of calculated output lengths and angles, and how they match the proportion value, proving similarity, regardless of the triangles’ shapes/sizes.